Let's Teach English: General Verbs “Have, like, & play” - who am I? General Verbs “Have, like, & play” - who am I? Practice for the so called “general verbs” “have,” “like,” and “play.” Students pick a character, and one student gives hints about his character, while the other one guesses who he is. 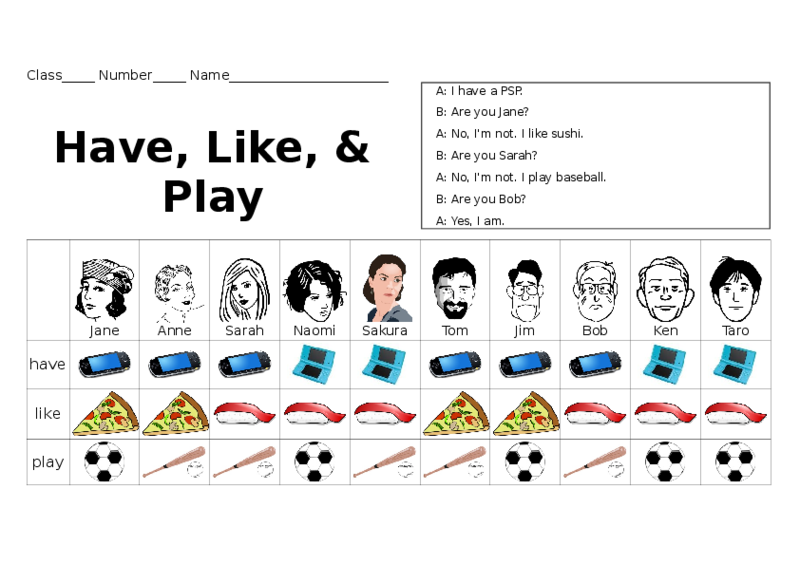 After going over the meanings and usage of “have,” “like,” and “play,” give each student a copy of the worksheet and have them break into pairs. Have each student pick one of the 8 characters, and give a hint to the other student, e.g. “I have a PSP.” The other student must then guess which character the other student has chosen, using the question “are you (name)?” If the student guesses right, he wins; otherwise, the other student replies “No, I'm not” and gives the next hint, e.g. “I like pizza.” The game continues on this way until the guesser guesses right, or until the hinter has run out of hints to give, and reveals his character. In case you have a hard time deciphering the pictures on the worksheet, the hints are as follows. Students are likely to have problems trying to read English names. Make sure to read and repeat the names of the 8 characters with the class, and have them take notes if they don't think they will be able to remember how to read the names. This worksheet uses clip art from Clipart ETC ( http://etc.usf.edu/clipart ) , a great free resource of clip art for educators.